Do you want to read tarot, but don’t want to wade through piles of long tedious explanations that bore you to tears? Then Tarot Made Simple is for you. Tarot Made Simple is a tarot guide for the 21st century. Forget about having to try and memorise page after dull page of metaphysical nonsense, Tarot Made Simple explains how the cards really work, and how anyone can start reading them in a day. ✩ How and why the tarot works, with no mumbo-jumbo involved. ✩ How to read the four corners of a tarot card. ✩ The only three shuffles you’ll ever need. ✩ A full complement of spreads you can use to answer any question you can think of. ✩ How to customise spreads, and even make your own from scratch. ✩ The one thing you must do before you start each reading to get the maximum benefit. ✩ Three ways to deal with reversed cards. Tarot Made Simple covers every card, showing you what you need to know to perform accurate effective readings with ease, but without boring you to death with unnecessary details that you’ll never use in real life readings. It tells you how to interpret the hidden aspects of each card, giving you real depth and insight into your readings. This no-fluff guide is written in easy to understand plain English and makes learning the tarot, well, simple! You could be doing your first reading today. ✩ A proven roadmap to take you from novice to professional reader. ✩ Three unusual places to find customers to read for. ✩ How to get people coming to you ready to hand over cash for your tarot readings. ✩ How to know precisely how much you can charge, and how much you should. 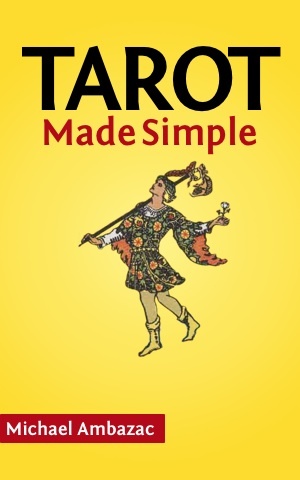 Tarot Made Simple is fully illustrated throughout. Learning tarot has never been easier.